It is a very long haul from Accra in Ghana to Agadez in Niger, but finally, on October 17, our group of seven in three 4WDs (Toyota Land Cruiser, Nissan Patrol, and Landrover Defender SWB) got there. In Agadez we stayed at the Fantasia camping (highly recommended). Very good potable water. After a few hours, cold (well, lukewarm) beer and soft drinks were even available from the ‘bar’. We fuelled the cars (CFA 359 per litre); each car had to carry 220 litres; fuel would only be available in Dirkou and Iferouane. Against all advice, we put the 6 jerricans on the roofrack; we would use them as soon as possible. We arranged the compulsory guide from the very reliable ‘Dunes Voyages’ (CFA 21,000 per day); the travel agency had arranged our travel permit. We had dinner in the excellent ‘Le Pilier’ restaurant. Ask for double portions of chips, otherwise you go hungry. Agadez is a great place to hang around for a few days. It is very comparable to towns like Gao and Timbuktu. Everything is available, fuel and other supplies. The temperature is great this time of the year (low 30s during the day; around 20 at night). People are very friendly. The first day we did approximately 120 km. 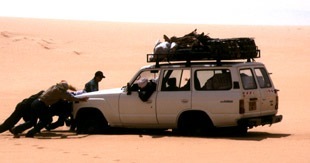 Immediately after leaving Agadez, there is a checkpoint, which will only let you proceed if you have a guide and have at least two cars. Particulars of cars and passengers were recorded and the travel permit was carefully studied. Officers are always very friendly. We were travelling through a bushy (very little vegetation) desert, alternating with grassy plains and stony (pulverised lava rock) plains. Usually there is a clear track. We drove along some completely barren cliffs and made a small detour to the Tuiguidit mountain range to visit some rock engravings. We met two of those amazing trucks, loaded to the maximum, with maybe a hundred people on top and all their belongings. You hardly recognise the lorry; it is just one heap of people, bags, mattresses, and jerrycans. A really great sight! The lorries come from Libya. We saw several others, but none was as beautiful as the first one. We also noted that one lorry was accompanied by an army jeep with machine gun [these were probably West African workers being expelled from Libya]. The day was crowned by seeing a camel caravan on its way to Bilma: 40-50 camels moving very slowly, carrying grass (the feed for their trip). They carry goat cheese, millet and groundnuts to Bilma and come back with salt and dates. During our second day, we got to the real desert. We had to deflate our tyres (18 PSI, back; 15 PSI, front), long before we reached the famous Arbre du Tenere. We got stuck occasionally but a shovel and a little push did the trick. Initially we still followed a clear track, but when the main track continues NE to Dirkou (via Achegour) you turn off towards Arbre du Tenere, thye track ends. The scenery is great, sandy plains with low dune ridges here and there, occasionally fine gravel. The plains are slightly undulating. At times the piste is marked with balises. In the afternoon we reached Arbre du Tenere (270km from Agadez), a metal tree and well in the middle of nowhere. Filling up our water supplies was not easy at Arbre du Tenere. We had no bucket and the water was 43 meters down. We used one of our cooking pots (now famous, because it has seen the well of Arbre du Tenere – very few cooking pots have). 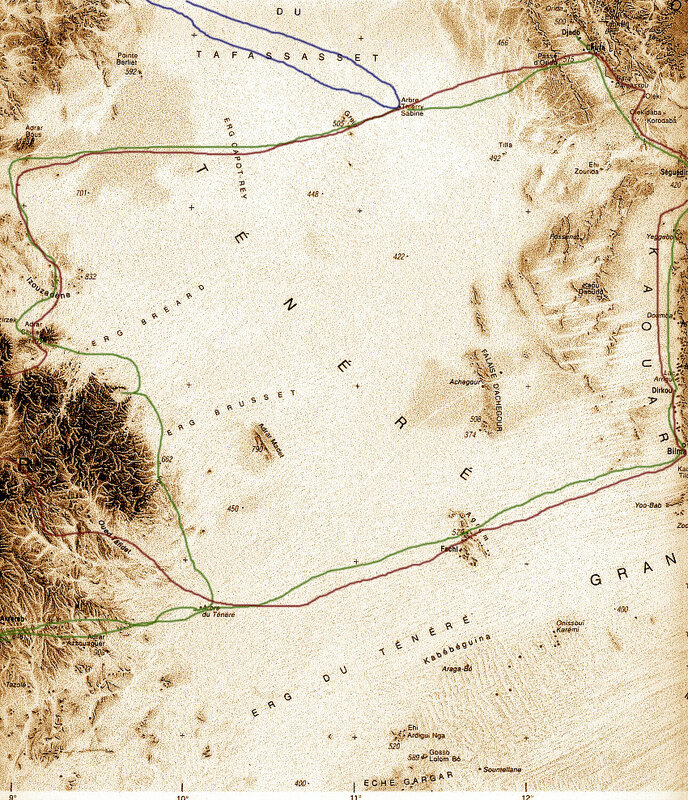 We needed all our ropes to get that deep, but managed to fill the jerricans; a very safe feeling in the desert. Next morning it was sand all the way to Bilma, not a single tree, no track or piste, just choosing a not too sandy path. We drove through a gassi with sand ridges at both sides, sometimes crossing the sandy ridge to go to a parallel gassi. We got stuck every now and then, but usually a little push would do the job. Twice we needed sand ladders and the shovel to get us moving again. We met more camel caravans, sometimes with hundreds of camels, on their way to either Bilma or Agadez. We wonder how long such beautiful scenes can still be seen. Just before entering Fachi we met large numbers of camel caravans, which are resting outside Fachi. 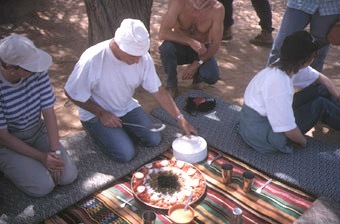 The Tuaregs are preparing their tea, the camels are resting and feeding, preparing for the next leg of their long trip. In Fachi (170 km from Arbre du Tenere and 440 km from Agadez) we reported to the gendarmerie and visited the old fort (pay CFA 500 per person to the Chief of the village). We were invited to tea with the chief. Fachi has 2500 inhabitants, a school, a dispensary and a number of mosques. Water is available everywhere from wells (we replenished our stocks). 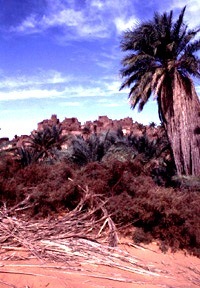 Flour comes from Libya, millet, groundnuts, and wheat from the ‘gardens’ in the Air Mountains. Vegetables and dates are produced in their own gardens. Next day, we cut through the mountains north of Fachi (stony, be careful with deflated tyres) and on to Bilma. More sand and caravans. Again stuck occasionally when climbing a dune. One looses touch with reality.. We entered Bilma through the site where salt is exploited. Lots of camel caravans are waiting here to take the salt to Agadez. Tuaregs have constructed makeshift huts with water storage (goats hides), plenty of dates and everywhere the kettle is on. In Bilma (610 km from Agadez) we reported to the gendarmerie in the old fort dating from the French period (ca. 1900) – no photographs allowed. Bilma is a bigger than Fachi, with 12,000 inhabitants; many gardens were plenty of vegetables are grown. What they cannot grow comes mainly from Libya. Bilma looks like a very quiet but friendly village, with sandy streets lined with mudbrick houses. It is off the main route, which goes from Dirkou via Achegour to Agadez. Before taking off to Dirkou, we visited the salt works; very interesting. The salt basins are very colourful. Different types of salt are produced. Big white crystals of kitchen salt for human consumption and salt for the cattle. The last type is not refined and still mixed with a lot of mud. 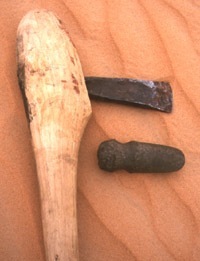 It is molded in the kantu form (pieces of hollow date palm trunks). In conclusion, crossing the Tenere from Agadez to Bilma was a great experience. Just before Dirkou we met two Austrian cars. They had come from Europe, via Algeria and Tunisia to Agadez and were now, like us, exploring the Tenere. In Dirkou we reported to gendarmerie. They keep your passport till you leave Dirkou. The place also seems to double as a gare routiere; full of people with bags and plenty bush taxis and lorries are loaded or off-loaded [probably more expelled workers]. Diesel comes from Libya and is cheap (CFA 300 per litre) – available from the well-known Jerome. Fuel is taken from a drum, which is put on top of another to provide gravity. Our Toyota took almost a full drum and we calculated that fuel consumption between Agadez and Dirkou had been around 4.5kpl. Fuel is also available per jerrycan. Dirkou is much bigger than Bilma and it has a bar (run by Nigerians). We visited the market to buy a well bucket and onions. The track north of Dirkou is a big flat sand plain, with a clear track occasionally. The hill of Pic Zumri is a good landmark and then Seguedine is not far. In Seguedine we took water, visited the old fort (probably from the same period as Djado). To Chirfa our guide took a route which was much more to the east than the track on the IGN 1:200,000 map. It brought us to the Oleki mountain. Our guide suggested that we should cut through the mountainous area, keeping to the track would make us reach Chirfa after dark. This appeared to be a big mistake, the guide should have turned west, just before or after Mount Oleki; this would have saved a lot of time. Thirty kilometres before Chirfa we found a beautiful camping spot (by far the best so far) in an area with a few trees and where years of wind erosion had shaped the rocks into nice ‘kopjes’ as the South Africans say. Via the Oasis of Sara and Dabasa we drove to the fort just before Chirfa. At the military post our passports were kept till we would leave Chirfa. Chirfa is a very nice desert village; built from mudbricks with maybe a few hundred inhabitants. Almost each house has its own well and in the walled gardens vegetables and maize are grown. All other needs come from Libya. In Chirfa we hired a second guide; a Tubu who knows the area very well. He was an old freedom fighter commandant costing CFA 10,000 per day. According to our guide it was the Tuaregs who are stealing cars from tourists, not Tubus. There is peace now; the former rebels are almost all integrated in the police force and the army. We took off to see the places of interest around Chirfa and our first stop was at the Arch de Fadagana; a wonderful arch shaped by millions of years of wind erosion. Yes the wind, it is the first time that we felt the strong wind blowing, carrying lots and lots of sand and making it rather unpleasant to be outside. The rock formations in this area are most bizarre; all have interesting shapes. 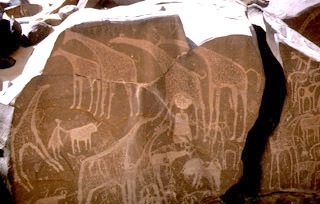 We also visited some rock engravings (elephants and giraffes). 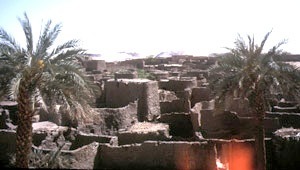 A very sandy track leads through a green area to the fortified village of Djado. Ancient Djado, built from mudbricks, is situated on the top of a small hill. In its 18th century heyday it must have housed more than 1000 inhabitants. It has many small streets, houses, etc. The complete village could be sealed off to protect it from attackers. The village had its own well, which looks very dirty today. Interestingly the area around the village is under 1 meter of water from December to April. We also visited Djaba, a similar fortified town. Behind Djaba there is a well, which you can hardly find; in the centre of an old tyre lying in the middle of nowhere, similarly there is a well at the foot of the Ouarek. Between the two wells there is a Tubu military post. We made camp at a superb site at the foot of the distinctive Orida outcrop. The scenery in the Chirfa, Djado, Djaba area is magnificent, with steep, wind-eroded hills (Ouarek, Ehi Guezebida and Orida) rising up from sandy plains interspersed with small oases and mountains in the background. The only disadvantage was the strong wind that was blowing. In fact, it was extremely uncomfortable and it had a negative influence on the spirit of the group. Did we really have to go all the way to Enneri Blaka? But it was less than 100 km away! We would go. Enneri means valley, while Blaka is the name of a famous Tubu freedom fighter. Dunes Voyages had indicated that security in the mountains was no problem; except for a few tribesmen the Tubu were at peace with the Niger government. Take a Tubu guide and you are OK. We had to climb the ridge to get into the Enneri Domo, which leads to Enneri Blaka. The ascent (550 metre) is difficult; sand, with rocks then just sand. Once up, we followed the Enneri Domo, a wide valley with black mountains all around. The going is very slow and the landscape – although an interesting moonscape – does not change anymore and becomes monotonous. The valley is extremely dry; there is hardly any vegetation; just an occasional tree or bush. It has not rained in Chirfa for 11 years; in the mountains it rained only once during that period. Then we joined the Enneri Blaka and the scenery changed to white/yellow sand alongside the very black hills. It was worth the five hour drive. To get to the ‘submarine’ rock formation which holds the rock paintings, we had to drive up a sand dune. We decided to take a different route back and took the turn off to Seguedine, up to the Oleki, where we were two days before. This time we did not need the guide to tell us how to get to Chirfa. We decided to go cross-country, just before the Oleki and had a great experience, by complete off-road desert driving without the help of the Tubu guide. In fact, the waypoints of two days ago were used to get us to the site were we camped two nights before. This was the track the guide should have taken the first time. 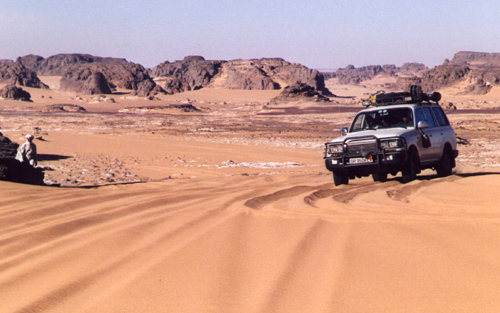 Next morning we drove to Chirfa, using a track, which passes the oasis of Sara, as well as Dabasa at the left side. This track avoids the military checkpoint. In Chirfa we said farewell to our Tubu guide, took fuel (CFA 400 per litre; we were told that there is always fuel in Chirfa) and water. Returned to the military post to get our passports back and ready for the crossing east. We were promised that we would see ‘beaucoup de rien du tout’. We left the military post, passed through the Col de Chandelier where rock formations are again carved by years of wind erosion into fascinating objects. From here the real Tenere starts. It becomes flatter, less stony and more sandy. Initially, we could only reach 35-40 kph, but later we drove at 80. Soft sand does not permit the car to reach higher speeds. In fact, do not stop, keep speed or get stuck. The car was using lots of fuel. It all is very unreal; sometimes you think you go uphill, but you’re not; sometimes downhill, but no. All around it is flat, sandy and barren. We met nobody no other life sign. Suddenly we saw a falcon flying; what is it looking for? It means there must be something to feed on in the desert. Then vaguely, far ahead of us a small hill appeared. Was this Grein? No Grein was still too far away. It was Arbre Perdu. How was our guide able to find this small hill in a vast sea of nothing? Arbre Perdu is nowadays called Arbre Thierry Sabine (originator of the Paris-Dakar rally). It is not much of a tree, but there is a little greenery that tries to survive. Then, after more driving through a sea of sand, we reached Grein, a series of hills 165km away from Chirfa; we took 4 hours to reach it. It was midday and the temperature was pleasant, mid-30s. Off for the last 200 km to Adrar Bous; stopping remained risky, keep going. As soon as the hills of Adrar Bous came in view, the landscape became stunning. A number of individual, black hills were rising from the sand. It all looked like an ocean of sand with a few rocks. Crossing the Tenere du Tassafasset took a little more than 7 hours. We camped near Adrar Bous. It was the first cold night, approximately 12C. Near our campsite we found Neolithic arrowheads. From Adrar Bous, we drove to the Dunes de Temet. Then in four days back to Accra in Ghana, completing a 7500-km trip. The crossing of the Tenere from Adagez to Bilma and from Chirfa to Adrar Bous was a great experience. It was the first time that we were in a real desert. You are really on your own out there. While crossing such an immense sand sea you realise how small human beings are. The camel caravans are a sight not easily forgotten. All along it felt like being in a little boat on a big ocean. Anything could go wrong and what next? Security wise, we always felt safe and never had the feeling that we had embarked on something that was dangerous. One must however be well prepared; it is not a trip that can be undertaken without thorough preparation. A guide more than one car are essential. Cars must carry up to 240 litres of fuel. Deflated tyres, almost all the way, are essential. Expect heavy fuel consumption of around 4.5 kpl (14 mpg). September/October is indeed a good period to visit this area. The temperature during the day is in the 30s (up to 40) and not colder than 10 during the night. We only had a very nasty wind in the Chirfa area. This entry was posted in Desert Babbles (blog) and tagged Adrar Bous, Arbre perdu, Chirfa, Col de Chandelier, Dabasa, Dirkou, Djaba, Djado, Ehi Guezebida, Enneri Blaka, Enneri Domo, Fachi, Grein, Oleki, Orida, Ouarek, Sara, Seguedine, Tenere du Tafassasset, Tubu rebels on May 18, 2015 by Chris S.